The year 1999 registered the highest number of disasters since the last 10 years. The trend for the last decade shows that the Asian continent is most frequently hit by disasters. In 1999, nearly 40 per cent of the total disasters took place in Asia. 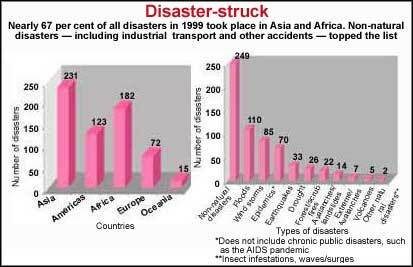 Africa has also seen a gradual increase in the number of disasters in the 1990s -- from 51 disasters in 1990 to 182 in 1999. Experts believe that, poor disaster preparedness programmes and flawed management policies have resulted in the high death toll -- 80,404 in total, besides affecting 2.2 billion people.